I think I’ll change my “Lady Alone Traveler” posts to “Driving Lady Alone Traveler” because Handy kindly chauffeured me around all weekend. It started on Friday with a trip to an art walk a few miles south of here. We walked from “art stop” to “art stop” and we had an interesting time. I saw an old friend who was one of the artists; it was the highlight of the evening. Then we made a slight miscalculation and stopped at a popular eating and drinking establishment in the vicinity. I didn’t bother to check Yelp; the parking lot was crammed with cars. What could go wrong? Handy and I entered through the bar. We’re average looking, both of us on the tall side. We’re not hipsters, but we also don’t have big puppet heads or anything like that. We looked like Mainers—no more, no less. Maybe we had entered through a forbidden door. Who knows, but every neck in the bar rotated towards the entrance to look at us and gave us one of those “who the BLEEP are you” looks. We walked from the bar to the hostess check-in and learned about the hour-long wait. Through the silent language of hungry people, Handy and I agreed this would not do and we “no thank you’d” the hostess and left along the same path of shame we’d come in on. I entertained Handy on the drive along Route 1’s food desert (Saco to Portland) with a dramatic reading of Yelp reviews. We ate at a run of the mill pub in The Celestial Food City (Portland) and called it a night after a quick stop at Whole Foods to pick up onions and chili powder. Fast forward to Sunday afternoon and the week-long awaited Old Goat Chili Cook Off. My chili was tasty, but it was average. 4 beans, 2 meats, and a number of spices toasted over low heat before being folded into the translucent onions. The simmering dish was enhanced by 2 bottles of a dark beer called Coal Porter. No cinnamon, no secret cache of spices. 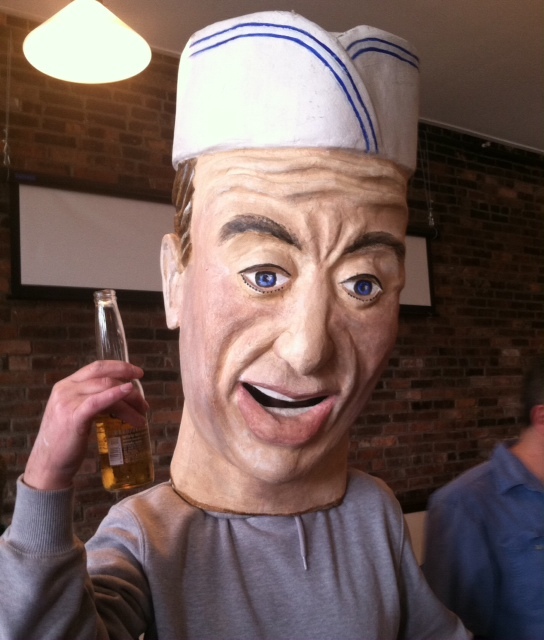 It was a damn good time of local people sampling 20 different chili recipes and no one batted a catty eyelash when the big puppet head showed up. I won’t bore you with more chili stories other than to say my “Aunt Tomato’s Slow Burn” did not win. I wasn’t even an honorable mention! To be perfectly honest, I don’t remember which chili won, but it was so much darn delicious fun. Everyone was happy for the winner and showed their appreciation with several rounds of clapping and cheering. Even the big puppet head was swaying back and forth. And that, my readers, is the way life should be. This entry was posted in Back to School and tagged chili cook-off, Scott McIntire, The Old Goat, weekends in Maine. Bookmark the permalink. Glad things went well at The Old Goat, and while you didn’t win, experiencing the kind of vibe that ought to be the norm at any place inviting you in to break bread is always validating and good reason to return someday. While spending some time in one of the tourist towns on Maine’s south coast, where the smell of old money is never far away, we felt welcome and didn’t get any of that “who the BLEEP are you” kind of sh*t.
It’s funny how some places have a welcoming vibe and some places don’t. I suppose I could say “maybe it was my perspective” but I felt a distinctive “we have nothing for you here” vibe at that “run of the mill” bar and grill. I am glad to hear things south of it are accommodating.